Logitech has announced details on its new Harmony Living Home control lineup, designed to extend Harmony control beyond the theater room to include lighting, window shades, temperature, security, and more. The line features two remotes, plus the Harmony Home Hub that offers RF, IR, Bluetooth, and WiFi control and a Hub Extender that's compatible with ZigBee and ZWave wireless products. Logitech announced it is bringing its expertise and leadership in universal remotes to the home control market with new home automation product compatibility and four new products. The new Harmony Living Home lineup gives you easy access and control over a wide library of entertainment and home automation devices, all from one centralized control system. With just a few easy steps your remote, tablet, or smartphone can now control your TV, set-top box, speakers, lighting, thermostat, door locks, window shades and other popular devices. Plus, you can easily combine multiple devices into Activities to trigger at once, so you can power on your TV, dim your lights, adjust the temperature, and open your window shades all at the same time. You can start an Activity with one touch of your remote or mobile device, automatically on a custom schedule, or by passing a sensor. You can even trigger Activities from the Harmony Mobile App when you're not at home. The Harmony Living Home experience is made possible by the Logitech Harmony Home Hub. It uses RF, IR, Bluetooth, and Wi-Fi to relay commands from Logitech Harmony Living Home remotes or the Harmony Mobile App to the wide array of home entertainment and home automation devices. The Logitech Harmony Home Hub is included with the Logitech Harmony Ultimate Home and Logitech Harmony Home Control, or it can be purchased separately for a suggested retail price of $99.99. The Logitech Harmony Ultimate Home remote features a bright 2.4-inch color touchscreen and allows you to integrate and control all of your compatible home automation devices and up to 15 home entertainment devices. You can swipe and tap the touch screen to access all your Harmony Activities, see a device's status and modify its settings, change channels, adjust volume, and fast-forward or rewind. The Logitech Harmony Ultimate Home is available in black or white for a suggested retail price of $349.99. For those who prefer a simple, button-only remote, the Logitech Harmony Home Control - in addition to the Harmony Mobile App for your tablet or smartphone - works with the Harmony Home Hub to give you access and control of your home automation devices and up to eight home entertainment devices. The Logitech Harmony Home Control is available in black or white for a suggested retail price of $149.99. For customers wanting even more control, Logitech also introduced the Logitech Harmony Hub Extender. The Extender enables additional compatibility of the Logitech Harmony Home Hub, controlling lights, locks, sensors, garage doors, and other devices operating through ZigBee or ZWave. The Logitech Harmony Hub Extender is expected to be available for a suggested retail price of $129.99. August, Honeywell, Kwikset, Lutron, the Nest Learning Thermostat, PEQ, Philips hue, Schlage, SmartThings, Sylvania, Yale, and Zuli are among the brands and platforms joining the Harmony library of more than 270,000 compatible devices. And with the introduction of the Harmony Developer Program, the list of compatible devices will continue to change and grow. For the most up-to-date list of compatible devices, please visit myharmony.com/compatibility. If you're a brand interested in becoming a part of the Harmony Developer Program and integrating with the Harmony platform, please visit myharmony.com/developer. 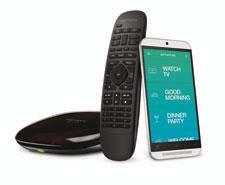 The Logitech Harmony Living Home lineup is expected to be available in the U.S. and Canada beginning in September 2014. For more information on the Harmony Living Home lineup, please visit www.myharmony.com or our blog. • Logitech Harmony Smart Keyboard Universal Remote Control Reviewed at HomeTheaterReview.com. • Logitech Harmony Touch Universal Remore Control Reviewed at HomeTheaterReview.com.